Telling the Asantes' story of their hundred-year war with the British Empire--from 1807 to 1900--a saga of massive resistance against overwhelming odds reveals a wealthy, sophisticated culture and balances our view of native African societies. For centuries the Ghana nee the Gold Coast nee the Ashanti kingdom has been a major producer of gold. The 16th century arrival of European powers on the West African coast opened up vast new trading opportunities. The Europeans tried to push inland to locate the source of the gold, while the Ashantis tried to subjugate the coastal dwelling Fantes who intermediated the trade between the seafaring Europeans and the Ashanti and other inland groups. This book describes the 100 years on-again off-again war between the British (and their Fante allies) and the Ashanti (supported by the Dutch). The author is an anthropologist and his intepretation of events emphasizes the cross-cultural incomprehension of two societies (Victorian Britain, and late Ashanti Empire) which in some ways were remarkably similar: aristocratic, hierarchical, chauvinistic, imperialistic, militaristic. Some of the stories are fascinating as in the depressing case of the British kidnapping and torture of an Ashanti peace emissary which predictably leads to Ashanti mobilization and the seige of the British castle at Cape Coast. Or the fact that it takes 70 years for the British to figure out that desertions by the Fante were less motivated by cowardice than the fact that the British were forcing their Fante porters to do culturally innappropriate "women's work." Nevertheless, the author clearly likes both the British and the Ashanti, so he makes constant references to the "cowardly" "perfidious" etc. Fante. What the Ashanti could not do, malaria and dysentary did (they don't call West Africa "White Man's Grave" for nothing) and in the end, the British need howitzers and Yoruba troops brought in from Nigeria to capture the Ashanti capital of Kumasi. The final armed resistance to the British is led by an old woman named Yaa Asantewaa who after her capture died in exile in the Seychelles. The Ashantis never really made their peace with the British and this history has relevance for contemporary Ghana as manifested by the underrepresentation of the Ashanti in the politically influential armed forces, relative to other ethnic groups. This is a great book, epically for a novice in African history. While American are taught about the different European civilizations we are thoroughly ignorant about similar African civilizations. The Asante Empire was long established in Western Africa (present Ghana) and had an advanced civilization. They had a well organized army, with at the time of the first conflict with Britain, were armed with modern muskets. They had a well organized government and religion. The conflict with the British was far from a cake walk for the British. The Asante fought bravely for their freedom and gave the British everything that they could handle. The British were not able to subdue the Asante until the progress in arms technology made the Asante armaments obsolete and gave the British a huge advantage. Eventually it was British howitzers vs. Asante muskets. The hundred year war for Africa's gold coast. A good book about the end of the Asante Empire. Edgerton tells the end of this empire from both the British and Asante perspectives. The Asantes were a militaristic society who preyed on the weaker societies around them, notably the Fante. The British desired trade and gold, and the conflict was inevitable when the Asante sent armies to conquer the Fante. This brought the British into conflict. The author takes too much of a nativist perspective in his depiction of the Asante Empire. This empire gloried in slaves and human sacrifices. It had a great military tradition, but why would a author try to paint a positive view of a society that sought entertainment value in the putting to death of slaves. The British may have been interested in conquest and colonization of this land for trade and gold reasons. They may have been rascist, but the Asante were a brutal society. The expiration of this empire was perhaps not such a tragedy after all. The British brought Ghana and the Asante into the modern world. Many students or afficianados of 19th century British colonial wars in Africa are only familiar with the more well-known episodes of same, such as the Anglo-Zulu War, the Boer Wars or the travails of Gordon and Kitchener in the Sudan. This book is fascinating for its very readable study of the Asante (formerly Ashanti) tribe of modern day Ghana, which actually had a standing army armed with muskets and organized along neo-European tactics, who dominated their tribal neighbors and gave the British army and its African conscripts a real run for their money over an approximate 100 year period. The author treats both sides of the conflict fairly, and it is apparent that the Asante wanted peace with the British in order to enhance their own prestige and trading opportunities in the area, but the British, under the guise of stamping out oppression to their coastal tribe allies and to stop human sacrifice, took it upon themselves to march inland and crush Asante dominance on several occasions, although not without being bloodied in the process. This is one of those works of history that opens the door to a little known chapter of British military history, and which reads like a novel. Highly recommended, and contains some interesting illustrations and photographs as well. 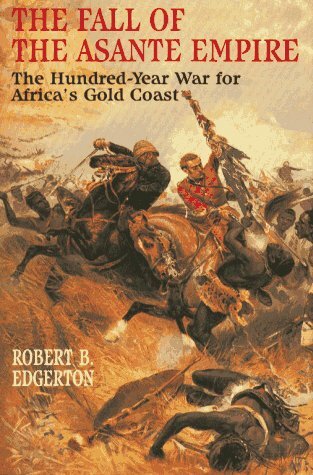 _The Fall of the Asante Empire_ by Robert B. Edgerton is a rather engaging book that can be read on several levels. It is an account of one of the last existing preliterate sub-Saharan African civilizations, the author providing speculation and first-hand contemporary accounts of one of the most noteworthy and powerful non-European civilizations of West Africa. As one might imagine it is also a vivid, detailed, and exhaustive (though certainly not tedious) tale of the various cold and hot wars that broke out between an ambitious, imperialistic British Empire and a sometimes bellicose but often surprisingly peace-loving native civilization, a tale filled with bravery, treachery, humor, and tragedy, of an African state that though locally quite powerful was increasingly aware of the growing disparity in military might between the two civilizations. It is also an interesting study in international affairs; one filled with failed peace attempts, misread intentions, and missed opportunities for peace. The Zulus are with good reason both during the 19th century and today a highly respected example of the military power, success, and bravery of native African armed forces, one that for a time prevailed against a much more powerful British Empire, its flamboyantly dressed and clearly very brave warriors capturing the imaginations of many Westerners. The author though laments that for many Americans and Europeans recognition of the valor and success of the African fighting men begins and ends with the Zulus. Largely unrecognized is the longest and most successful military resistance to European colonization, that of the Asante of Ghana, which fought against the British from 1807 to 1900, a century long conflict of numerous small and many large battles, several of which the Asante were the clear victors, the only West African army to defeat the Europeans in more than one major engagement. At the start of the 19th century the Asante Empire was at its height, easily the most powerful state in West Africa, an empire of over three million people in what is now Ghana and then referred to as the Gold Coast. This was more than half as many people as there were in the U.S. at the time and more than one quarter of the population of Britain (eleven million people in 1801). In land area the empire was larger than England, Wales and Scotland (or the state of Wyoming), stretching four hundred miles north from the coast, dominating nearly five hundred miles of coastline. The heartland of the Asante people was the tropical forest zone of the Gold Coast, a hot, humid, wet, and luxuriant forest that was not well-liked by Europeans. More than just the physical and population size of the Asante were impressive. Unusual among the native African states, the Asante, particularly at the beginning, had a remarkably successful governmental structure. It was able to balance the needs and desires of the king with a ruling oligarchy, a system of checks and balances in which sometimes the king was supreme on a given issue, at other times a near-parliamentarian body had the last say. It had a fairly large and successful government bureaucracy that oversaw many aspects of daily life. Though the empire included many subject kingdoms, conquered peoples, and a sometimes restive slave population, it had a surprisingly cohesive national identity, a "deep patriotism" that survived the worst military setbacks in a century of conflict, that despite internal divisions among a "hodgepodge" of people there was a surprisingly large core that was "always willing to fight and die for the Asante union." Most remarkable of all perhaps was the Asante fighting man himself. Despite the fact that most of its common soldiers were slaves, often recently captured, they often fought superbly and obeyed their orders with bravery and enthusiasm, amazing the British as they stood their ground against clearly superior firepower (which would later include artillery and machine guns). Also, most were only part-time soldiers, not living and serving in units like their British opponents, required to own and maintain their own flintlock musket (this long musket, called the "long Danes," gave the Asante an enormous advantage over their native neighbors as the Asante possessed a near monopoly on guns along the Gold Coast, though as the century progressed these guns became vastly inferior to later British weaponry). The heart of the book is an account of the military campaigns that took place between the two great powers, the author detailing the causes, course, and consequences of each battle, discussing the tactics of each encounter, the role various weapons played, the bravery (or cowardice) of individuals of note in each battle, whether the conflicts were small-scale conflicts that occurred basically by mistake or massive mobilizations of men, planned well in advance and involving tens of thousands of individuals. This made for gripping reading and the author, though primarily working with writings from those of the British side, nevertheless worked hard to provide a balanced portrayal of both sides of these various conflicts. Regrettably misunderstanding was as often at the root of Asante-British fighting as was British imperial ambitions, as each side "struggled with their colossal incomprehension of one another's values, religious beliefs, diplomacy, sense of honor, and national purpose." Both sides could be self-righteous, insistent upon their cultural and in the case of the British oftentimes racial supremacy. In many ways economics was at the heart of the conflict, but even there misunderstanding prevailed, as each side was oftentimes ignorant of the others needs and goals in that arena. Even attitudes towards the other's culture, even ones that did not directly affect the other, would color policy towards the other (such as the British distaste for Asante human sacrifice, well-detailed in this book, as well as the views of their source for porters and interpreters, the native Fante, who hated their Asante overlords and never missed an opportunity to paint vivid pictures of Asante "cruelty, rapacity, untrustworthiness, and lust for war," hardly providing a balanced portrait to the British).